It’s worth reading my blog today for this one idea alone. Divide students into pairs. The teacher poses a question. The students talk to their partner, agree on an answer, and then stoop down. When the teacher sees all students down she says, “Pop!” The students pop up and say their answer. Use paint sticks from Home Depot and write the number word and numeral on them. Use puff paint to make dot sets on them. Children pick the sticks out of a can and put them in order. *Put a smile face in the corner to make sure the stick is facing the correct way. Use this idea to match children up for partner work. Write higher students’ names on green apples. Write children who need extra help on the red apples. Pass the apples out and have children pick a friend with a different color for their partner. Take a paper bag and open it up. Roll down the bag from the top. Let children cut or tear purple, green, and gold (yellow) paper and glue it on the bag. You can also add a little glitter and put a small plastic baby in the cake. *The king cake is associated with Mardi Gras/Carnival. A plastic baby representing Baby Jesus is baked in the cake. The person who gets the piece of cake with the baby gets special privileges. Children hold their guitar and shake it like a rock star – but they have to do it silently! Children can only tattle with the 3 B’s – broken, bleeding, or bruised!!! 5 and 6 are naughty numbers because they face the wrong way. The magic “e” makes the first vowel a super vowel so it no longer makes the short vowel sound. Let the kids write the word and then draw a cape on the middle vowel. *Kellea also makes up motions for each sound in the alphabet. When they go through the alphabet each morning the students make the motion and then they do the letters in sign language. When visiting a museum, divide the children into partners and give each pair a clipboard with objects that can be found in the museum. As they find the items they can circle the picture. This will keep the children interested and learning while they have fun. You can use this game with high frequency words, numbers, etc. When the high frequency words come up on the smart board a child runs up, touches the word, and then tags a friend. Fold a sheet of paper in half and draw around the child’s hand with the outer side of the hand on the fold. Glue the unfolded handprint on paper. Make eyes and a smile on the handprint and write the numbers 1-10 above the fingers. Put the title using the child’s name on the top. For example: “Angelic’s Number Monster.” Let the children use their number monsters to practice counting, number recognition, etc. Introduce a nursery rhyme each week. Read it as a group and then at the end of the week create a page for that rhyme that children can add to their nursery rhyme notebook. By the end of the year, the children can read/recite about 30 nursery rhymes. They present their notebooks to their moms as part of their mother’s day present. The mothers love that their gift is their child reading to them! Honestly, I get so frustrated with some of the stories I hear these days I could scream!!!! It breaks my heart the way teachers are getting beat up and children are having their joy taken away! We have a friend who is seriously ill and my daughter reminded me that “life is fragile.” I’d like to remind some of the decision makers and people who evaluate teachers that CHILDHOOD IS FRAGILE! The way we are shoving academics down children’s throats is like giving them steroids. Sure, they may be able to pass the test today, but what kind of person will they be 20 years from now? I can’t do anything about assessment and your curriculum, but I can tell you to shut your door and sing and love and make learning fun. So, here are some great ideas teachers in Utah, Louisiana, and Mississippi shared this week that I hope will add a few smiles to your day! Where the moose and the caribou play. And the skies are colorful all day. Where the lynx and the lemming play. *Adapt to other habitats and places. Kathleen Wright sent me an email telling me about her website and blog. Her freebie list paper is a perfect way to encourage writing and reading. Take a dollar store photo album and put flashcards in it. Let children trace over the words, letters, shapes, etc. with a dry erase marker. *Put cheers on sticks for the students to choose. Staple several index cards together to make a book. One side will be plain for a picture, and the other side will have lines for writing. Make a black headband with a yellow circle on the front. Attach a letter to the circle so the children can go around the room and “spot” the alphabet. Give cotton balls to students who are exceptionally quiet because they are "quiet as clouds." Put an old phone on your desk for children to tell their concerns. Explain that you’ll listen to your messages at the end of the day. You might even want to have a directory. Press #1 for the principal. Press #2 for the school secretary. Press #3 for your teacher. Press #4 for your parents…etc. Put a box, notepad, and pencil on a shelf. Explain that when they want to complain or make a comment they need to write it on a piece of paper. They must start their sentence with a capital letter and end it with a period if they want the teacher to read it at the end of the day. Another teacher said she used the concept of an Oreo cookie for tattle tales. The child reporting had to say one nice thing, then the tale, then another nice thing. Choose a stuffed animal or puppet to listen to children’s complaints and tattles. Be sure and name the character. Explain that when you are busy they can always tell Teddy (or whatever) their problems. He’s always there waiting to be their friend. Here’s another great idea for tattle tales. Put a photograph of the President on your wall and say, “I’m just your teacher. Why don’t you tell the President?” You won’t believe it, but the children will walk over and talk to the picture! Tell the plant. Enlarge a picture of yourself and put it on a stick. Insert the stick in a plant and direct the children to the plant when they want to tattle. Sometimes a sense of humor is the best solution to a problem. Keep calm and laugh inside! This is a "cut and tell" story I did this week at a workshop. I think grown-ups love it as much as children. It was spring time and mother and father bird decided to build a nest. Who can tell me some of the things they might have used to make their nest? One day as mother bird was sitting on the egg, she heard a little cracking sound. She looked down and saw a little crack in her egg. And guess what mother bird saw coming out of the big crack in her egg? She saw her baby bird! Do I love my job or what? I have tons of things I need to do, but it’s more fun to be creative and do what I want to do! Phone Number – Let children practice typing their phone number. 911 – Discuss what you do when there’s an emergency. Be very emphatic about not calling this number unless it is a real emergency! Spelling – Spell names, word wall words, etc. Value – What is your name worth? Which spelling word is worth 10? *Can you think of other things to do with the phone? *Can the children think of things to do with their phones? DON'T YOU JUST LOVE TO READ, READ, READ! BUT WAIT! There’s more! In addition to the silly song “Read a Book” children can learn how to sound out words, play letter games, and build their own story. It’s pretty cool if I do say so myself. You know how I feel about screen time, but this app is so child-friendly and engaging - and they can’t help learning something. 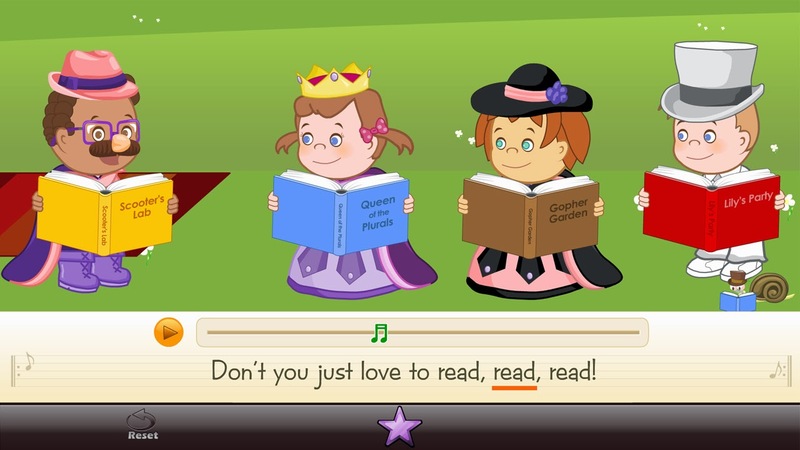 Many of the apps I’ve looked at have way too much going on for young children. These characters are sweet and the graphics allow the children to focus on the skills. I can’t believe you get the app and all the games for $.99!! You can’t even buy a cup of coffee or a candy bar for that price. I’m just tickled to be a part of something so positive and fun! Some of you have probably made this nest from a paper bag with me at my workshops. All you have to do is open the bag and then slowly roll out and down to create the nest. 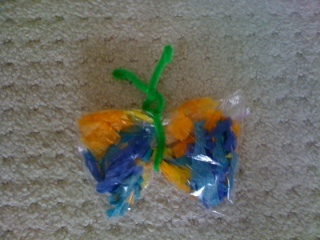 Recently, a teacher added to that by telling me about the tissue birds she makes with her class. Wad up one tissue and wrap another tissue around it. Tie a string to make the head and fluff up the rest to be the body and wings. (An adult will need to do this part.) Children can add eyes with a marker and glue on a beak. The teacher said it’s so cute to see the children put the bird in the nest and carry it gently as if it were real. *How about informative writing? How to build a nest. *Creative thinking - What would you do if you were a bird? Continue letting children think of names and motions for the birds. One more little bird day project that’s made with felt, glue, and a wiggly eye. Cut out two bird bodies similar to the one shown. Cut out the wings on the fold. Glue around the edges leaving a 2” opening in the bottom where you can insert your finger. Cut a 2” slot in the top and insert the wings. Add a beak, eyes, and you’re ready to fly. *Call it “Word Bird” and let children wear it to read words. *Use it to track from left to write as you read chorally or count on the calendar. Fly to a quiet friend, one, two, three. The child passes the bird to a quiet friend who comes to the front of the room and the game continues. *This is the perfect song to demonstrate the exclamation point and talk about exaggeration! Let children act out the life cycle of a butterfly. First, they lay on the floor in a ball. Next, they crawl around like caterpillars. Can they spin around and make a chrysalis? Finally, they can spread their wings and FLY! Cut butterfly shapes out of newsprint. Fold in half. Let children drop paint with a spoon or eye dropper on one half. Fold and rub. Open to view your butterfly. I've got a special free song download called "Caterpillar's Story" for you on my website on April 1st - and that's no joke! I’m off to Utah for their Early Childhood Conference. Salt Lake City is absolutely beautiful and I can’t wait to sing and dance with their enthusiastic teachers. Next week I’ll be in New Orleans and Jackson, MS, but I’ve been busy creating new blogs so you’ll get something from me every day! *Challenge children to construct a seesaw in the block center or with objects from a junk box. 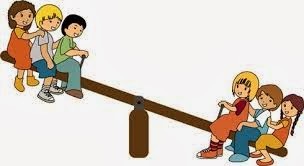 *Look for pictures of seesaws in children’s books. Yes, Virginia, there is a season called SPRING! I know many of you think it’s an imaginary land, but one morning you’ll wake up and hear a bird sing or see a crocus blooming through the snow. Hint! Do this as a large group activity with younger children. Note! You may need to adapt some of the items to your habitat. After a spring walk, have children write the word spring vertically down the left side of their paper. Can they write a word for each letter that is a sign or symbol of spring? Hint! With younger children do this as an interactive writing activity. How many words can they write from the letters in “spring”? Let children write the word spring in the middle of a sheet of paper and then make a spring design out of it. Bloom’s Taxonomy is probably the most well-known hierarchy of assessing thinking. As I was researching this topic I thought, "Do teachers really care about this?" The answer is YES because we all want our children to THINK! I bet you already ask many of these, so take a look and then you can kiss your brain! Level One – Knowledge – Ask students to identify and recall information. Can you tell why ________? Level Two – Comprehension - Ask students to organize information or put it in another form. Who was the main character? Level Three – Application - Have students use facts, rules, and principles. How is ____related to ______? Could you think of another instance where ____? Who would this information be useful to? Can you think of a lesson/rule from_______? Level Four – Analysis - Ask students to break information into parts. How does ____compare/contrast with _____? If ___ happened what might the ending be? What are the parts of______? What was the turning point____? What was the problem with_____? How is____ similar to ____? Level Five – Synthesis - Invite students to compile information in a new way. What ideas can you add to____? Why do you suppose that____? How many ways can you_____? Level Six – Evaluation - Ask students to develop an opinion or make judgments. Is there a better solution____? How would you have handled____? How would you feel if_____? What changes would you recommend_____? What do you think about____? Hint! Write sample questions for each level on color coded paper. Store them in a can and use them to spark questions. I’ve shared the “pick stick” idea before, but if you’ve never made them, this is a good week to give it a try. Take a look and see if you can find “pick” another simple idea for asking more meaningful questions. Pick Sticks – Ask each child to write his/her name on a large craft stick. Color one end green and one end red. Place the red end in the bottom of a can. Ask a question, and then choose a stick. That child gets to answer the question. Return their stick to the can with the red end up. Sign Language (Yes/No) – Teach children the signs for “yes” (wiggle fist in the air) and “no” (touch index and middle finger to thumb like a mouth closing). How Much Do You Know? - Children hold up on their fingers from 1-5 to indicate how much they know about a particular topic. Phone a Friend – If children don’t know the answer, allow them to phone a friend (place hand by mouth and ear like a phone) for help. *They could also “ask the audience” for help with an answer. Think Partners – Divide children up into pairs and let them discuss answers. Children can also review information by “teaching” a friend what they have learned. Written Response – Ask children to write the answer to a question. Illustrated Response – Have children draw the answer to a question. Choral Response – Children answer in unison. Brainstorm – Brainstorm as a large group, small group, or individually. 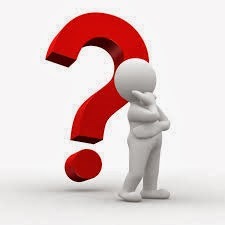 Question of the Day – Write a thought-provoking question on the board each day. Take time to listen to children’s responses at the end of the day. Student Created Questions – Let students generate their own questions for a review. Any more questions? Oh, so you’ve been asked to include higher level questioning strategies in your lessons. 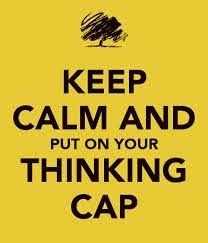 Well, come back tomorrow and we’ll do the “Cliff Notes” version of Bloom’s Taxonomy. 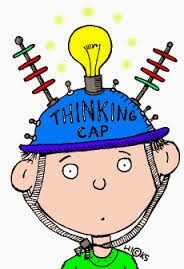 One of the most powerful questions teachers can ask is, “How did you know that?” If one child knows the answer and you ask them to THINK OUT LOUD and explain their reasoning, then it will help the other students scaffold to a higher level. You can use this strategy with pre-k children, 4th graders, or grad students. It works with a reading lesson, math, science, or social studies. Now, don’t be surprised when you start asking that question if they shrug their shoulders or respond, “I don’t know?” PAUSE! (Another great questioning strategy I’m not very good at.) Don’t say anything. Wait! They’ll eventually come out with something and then you can give them positive body language and say, “Good thinking!” Asking children to explain their thinking is good for the responder because it helps her clarify her thoughts. That child also serves as a constructive model for the other students. Here are some other “tips” for asking good questions. Open-ended – Ask open-ended questions, rather than “yes” or “no.” Convergent questions have one answer, but divergent questions encourage students to make new connections and think outside the box. Phrase Questions Clearly – Focus on one aspect at a time. Probe – Extend students’ thinking by having them clarify an idea or support an opinion. Give Time - Help children think about what they want to say and provide for individual differences by asking children to smile if they know the answer. Allow 3-5 seconds of think time. 1-2-3 Tell – Ask a question and then slowly count, “1, 2, 3.” When you say, “Tell,” the children all say the answer. Whisper & Release – Children whisper the answer in their fists. When the teacher says, “Release,” the students open their fists. Connections – Demonstrate how to touch index fingers to indicate that they have made a connection in their brain. This will engage children when classmates are answering a question and let you know that they understand. Now, here’s a question for you! Want to learn more about improving your questioning strategies? Come back tomorrow for another exciting episode! Here’s a leprechaun’s magic wand to make with your kiddles today. Take a square sheet of paper and color on all four sides as shown. Turn over and start at one corner and roll up tightly. Tape the end. Taaa daaa! 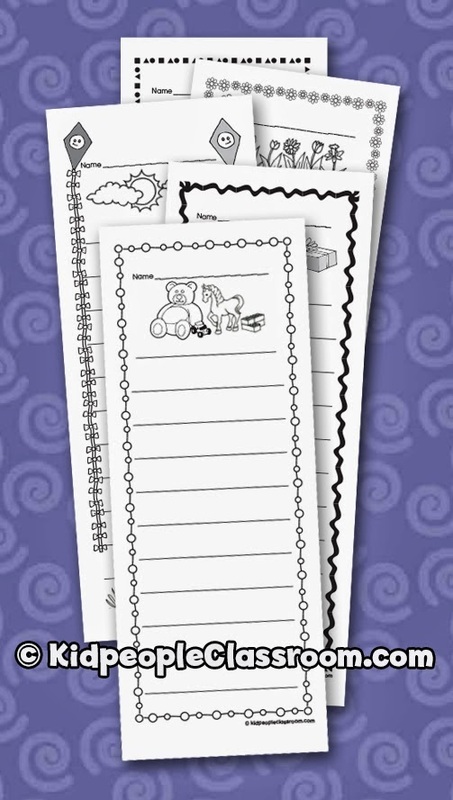 *Use the magic wands as pointers to track words, count on the hundreds chart, find details in pictures, etc. Children could also write stories about what they would do if they had a magic wand. Is your morning meaning (aka circle time) growing and growing and getting longer and longer? There’s limited time children can sit and pay attention, but this idea might help spark interest in your morning routine as you build skills. If you have 4 walls in your classroom, you could designate each wall for “My World,” “Math and Science,” “Word Wall,” and “Alphabet Wall.” No worries if everything is on one or two walls in your classroom. The key to the success is having children stand and move instead of having them sit. As children stand and face each wall or content area, you can engage them in some of the songs, movements, and interactive activities suggested. How? Sing songs about the days of the week or the months. Sing the weather song and have a “meteorologist” report. spell words with sign language, etc. How? Sing alphabet songs and play letter recognition games. Clap on consonants and jump on vowels. for letters with a tail. Hint! Even if you don’t want to do all of the above activities, try breaking your morning meeting up this week with one or two active songs and you’ll be amazed at how it wakes up the brain. I think everybody is ready for summer right now. Enough about snow and assessments - think sun and vacation! Some of my sweetest memories as a child were summer vacations with the family. I’m a big (old) girl now, but I still get excited about summer and visiting new places and making new friends. As you’re thinking about what you want to do this summer, here are some great locations where you can be a “tourist” and learn at the same time. I T K – I Teach Kindergarten! Want to win a free registration for the New Orleans Conference? Hope you can come play, learn, and build a special memory with me this summer! Directions: Choose five children to be hotdogs and stand in front of the room. Number them from left to right and explain that when you point to them in the rhyme they get to shout, “Bam!” and then fall to the ground. Directions: Cut hotdogs out of felt similar to the ones shown. Place five hotdogs on the flannel board and count them with the children. Tell the children to close their eyes while you remove several hotdogs. Have the children open their eyes and identify the number of hotdogs. How many are missing? How did you know that? Continue removing hotdogs with sets of five. *Scatter and count the hotdogs. Place them in a row. How many? Place them in a column. How many? Place them upside down. How many? Directions: Write numerals 1-5 on plastic plates with a permanent marker. Children roll the play dough into hotdogs and place the appropriate amount on each plate. Directions: Cut out hotdogs and tape them to the spring clothespins. Draw a frying pan similar to the one shown on a file folder. Cut a slit through the middle of the pan and insert the clothespin hotdogs. *Children can make up number stories by adding and removing the hotdogs. Directions: Demonstrate drawing pans (circles) and making hotdogs (vertical lines) to do addition problems. If I had 2 hotdogs (children draw 2 lines) and you gave me 1 more (children draw another line), how many altogether? *Children could erase or cross through hotdogs to demonstrate subtraction. My webmaster sent this interesting tweak on assessment. I think most teachers would agree with me that testing has grown out of proportion. Education is not about children and learning – it’s about a cold, hard test score. "If there's not a partnership in the education of the child, there's a disadvantage to the teacher," Burzichelli told The Star-Ledger. This whole assessment thing makes me ANGRY! Instead of teaching children, educators are spending their time testing. What’s the point? 40 years ago when I started teaching I didn’t have to worry about assessment and record keeping. But, you know what? I knew where each child was in my room. I knew their strengths, their weaknesses, and how to motivate them. I didn’t need to put them in front of a screen to have a computer tell me…I KNEW them from eye contact and hands-on experiences! I know I’m preaching to the choir. It’s like trying to hold back the ocean, but at least there are some rumblings and grumblings that might indicate a change is coming. Never give up! Children are like caterpillars. They need time to squirm and wiggle…create and explore…play and talk…do their own thing…and they will all FLY!! I don’t know what it’s like in your part of the country, but it is GLORIOUS here in South Carolina! I think we really appreciate the sun after such a long, dismal winter. You just can’t help but smile and have a spring in your step. And speaking of steps and springs reminds me of how much fun I had jumping rope as a child…and then teaching my students to jump rope. For some of the children it was easy, but other children really had to work at it. Being persistent and not giving up is a good thing to learn. Jump roping also encouraged social skills, motor skills, and oral language. It’s good for the body and the brain! Here are some chants we used to say, but you can adapt them if you don’t like the words. You could also use these on a rainy day. Just have the children get a pretend jump rope and jump along as you say the rhymes. *You can jump on two feet or alternate jumping on feet. Do you remember any jump rope rhymes? I’m sure if you asked Mr. Google you could find hundreds to add to this list. But, watch the words because some of them might be a little inappropriate! HEY! HEY! BACK IN THE USA!